Showing results for tags 'unisphere'. Just listed on eBay. Your very own Unisphere--- https://www.ebay.com/itm/1964-NEW-YORK-WORLDS-UNISPHERE-REPLICA-COMMISSIONED-FOR-50TH-RETROSPECTIVE/283374866992?hash=item41fa755230:g:dvkAAOSwhEhcCZ4b:rk:29:pf:0 I wonder whose exact anniversary it was commissioned for in 2014? What a bargain. Found this on my visual on line tour of the park. I realize why no one every took this photo, or one like it. A Life magazine cover it is not. Well, the earth is two-thirds oceans, isn't it? And who would pose in front of this view? No wonder USS had to calculate why this thing wouldn't roll off the base with high winds. I just never have seen this side of it. (Even though I walked around it) Most photos are North America/South America centric. Which starts me wondering, who determined which way it would face? I know it would have to show a good side to the New York towers. Hi. 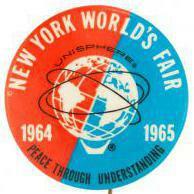 New member just getting started on collecting items from 1964-65 NY World’s Fair. I especially like the Unisphere. Looking forward to leaning more from this community.